A 6-acre former brownfield on the Raritan River in Perth Amboy is being converted into the new 2nd Street Park. The site, previously Harry S. Goldberg and Sons Scrap Metal Recycling property, was acquired by the City of Perth Amboy in 2003. The property contained hazardous materials including, chlorinated volatile organic compounds (VOCs), polycyclic aromatic hydrocarbons (PAHs), polychlorinated biphenyls (PCBs), lead and other metals. In 2009, the Middlesex County Improvement Authority received a grant from the U.S. Environmental Protection Agency (EPA) to clean up the site. 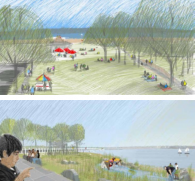 The park was created through a collaborative effort between Rutgers Edward J. Bloustein School of Planning and Public Policy, Rutgers Center for Urban Environmental Sustainability, Middlesex County Improvement Authority, and the City of Perth Amboy. A team from the Bloustein School was responsible for community outreach. Outreach approaches included, community workshops, youth outreach, an online survey, and a blog. The team also convened a steering committee made up of community leaders, to provide input into the park’s development. Landscape architects and students from the Rutgers Center for Urban Environmental Sustainability worked on the design of the park. The park design prioritized resident suggestions and preferences, which included educational value, environmental resilience, accessibility, and safety. The park will be easily accessible by public transportation. Dr. Wolfram Hoefer, of the School of Environmental & Biological Sciences Landscape Architecture Department and the Rutgers Center for Urban Environmental Sustainability, gave a presentation on the development of 2nd Street Park at the Sustainable Raritan River Conference in June, 2016. A copy of his presentation can be found on the conference website. In 2017, the City of Perth Amboy moves forward with the concept and has contracted with the Landscape Architecture firm SCAPE to develop construction documents and oversee construction. For more information on the park or the community outreach effort, contact Dr. Hoefer at whoefer@sebs.rutgers.edu or Jon Carnegie from the Bloustein School at carnegie@ejb.rutgers.edu.